Have you been thinking about giving full-time RVing a shot? There’s something magical and enticing about a life on the road. You can wake up in a new place every day if you want, and there’s no mortgage to pay or lawn to mow. For most people, deciding to RV full time is a huge lifestyle change. Before you sell your home or quit your job, it’s important to plan ahead. Here are 7 things you should know before deciding to become a full-time RVer. Living in an RV gives you freedom. You can travel where and when you want, and explore the most remote and beautiful parts of the country. The truth is, where you get to go will depend on how big your rig is. Many national parks and wilderness roads have strict length and/or height restrictions for RVs. While smaller isn’t always better, a small rig will definitely allow you to visit more places. One of the biggest tasks you will face when preparing for life in an RV is getting rid of a house full of stuff. When it comes down to it, you need very little “stuff” to live comfortably in an RV, and the fewer material possessions you have to manage, the freer you’ll be in your new lifestyle. When you travel full-time in an RV, you have to expect and be prepared for things to go wrong. An important, but perhaps dreaded task, will be shopping for insurance. 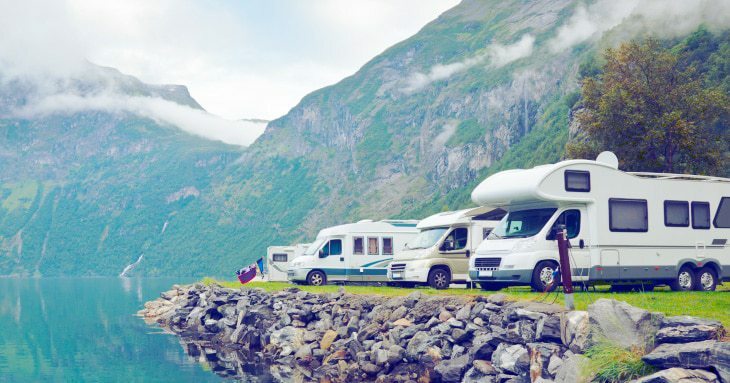 Here’s what you should look for in your RV insurance policy. Liability insurance – This will protect you if someone is hurt in or around your RV. Make sure your policy covers incidents when you are parked in camp and on the road. Replacement coverage – This covers the cost of your RV if it is lost or totaled due to an accident, fire, or other disasters. With new RVs, you will often be covered for the full purchase price, but older RVs will usually only be covered by the fair market value. Personal property – You need to calculate the replacement value of your personal possessions, so you are fully compensated if something disastrous happens. Most policies will come with standard coverage of around $5,000, but it’s important to look at the numbers and purchase extra coverage if you need it. Towing – The cost of towing an RV can be really expensive. We recommend purchasing a separate towing package from a company that specializes in towing large rigs. Your domicile is your official state of residency and will be the state where you pay taxes and register your RV. Your health insurance and government benefits will also be based on your domicile. You will need to have a legal street address and a driver’s license in your state of choice. Many people choose domicile states because they have no income tax, which can be a huge saving. Texas, South Dakota, and Florida are the most commonly chosen domiciles for this reason. 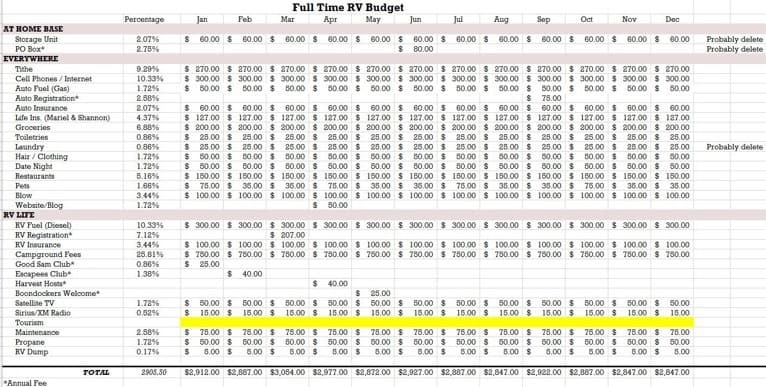 If you’ve never lived in your RV full time, you may not know where to begin when creating your budget. Costs can vary wildly depending on the size of your rig, where you travel, and what types of campgrounds you stay at. Your fixed costs won’t change much and will include your insurance payments, internet and cell phone plans, and groceries. The cost of fuel, camping fees, and maintenance will be harder to calculate. Do your best to estimate these, and then adjust them as necessary. Staying connected becomes more important when you’re living and working on the road. If you use a computer to work from your RV, it will be even more important to set up the good internet and cell service. While many campgrounds and RV parks do have Wi-Fi, it’s notoriously slow and will drive you crazy before you can get all your work done. We recommend getting a meaty cell phone plan that includes unlimited data and then boosting your signal with a product like weBoost. As for getting your mail, there are lots of mail forwarding services that will forward mail to a location of your choosing. Many full-time RVers will tell you that campground fees are their biggest expenditure. To minimize this cost, it’s worth looking into either boondocking or becoming a campground host for part of the year. Boondocking simply means camping without any hookups. The Bureau of Land Management allows free dispersed camping on many tracts of land, especially in the western half of the United States. Dispersed camping areas have restrictions for how long you can stay in one place, but it’s worth seeking out these free sites. 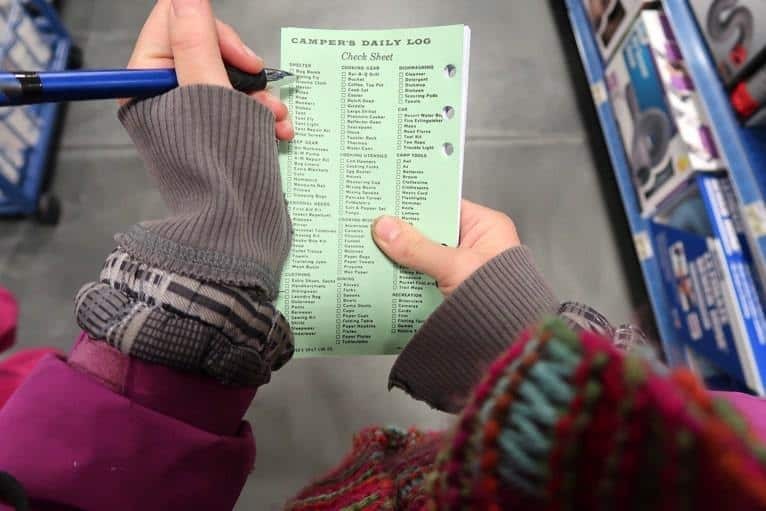 Another way to save on campground fees is to volunteer as a campground host. Most state and national parks require a six-week commitment and will provide you with a campsite, firewood, and propane in exchange for hosting. Becoming a campground host in the popular parks can be competitive, but smaller parks are always looking for volunteers. Check with the National Park Service, National Forest Service, or state park services to learn more about volunteer opportunities. If you love road tripping, meeting new people, and waking up in a new place each day, chances are, you’re ready for the adventure of full-time RVing. If you’re thinking about taking the leap, we’d love to hear how it’s going.